It's About TV: Efrem Zimbalist, Jr., R.I.P. There was a moment or two, back when I was a kid, when I thought a career in the FBI sounded like a cool idea. It was, as I recall, when I was sick with the flu, and my aunt gave me a pamphlet she'd gotten from someone at work, "101 Facts About the FBI," or something like that. It made it sound like FBI agents did a lot of neat things, investigating crimes like counterfeiting and kidnapping and the like, but then I came to the part about how agents had to have either an accounting or a law degree, and that sounded like too much work to me, so I forgot about it. Zimbalist knew J. Edgar (became a lifelong friend of him, in fact), for every year when the show's production would come out to Washington to shoot some exterior shots establishing location, Hoover would have him come to his offices where they'd chat a bit. He'd then address the agents, who cheered him as their hero. Hoover liked the show, and why wouldn't he? As I've remarked many times before, the intro alone, with its shots of Washington icons like the Capitol, the Washington Monument, and the Supreme Court, was enough to make you want to sign up. In that few moments you had, encapsulated, the entire power and majesty of the United States Government, summed up by the FBI's mission to "protect the innocent and identify the enemies of the United States Government." And Zimbalist was the perfect man to embody that philosophy. A story about Efrem Zimbalist, Jr. - I've told it before, so bear with me if you know what's coming: many years ago, when the scandals of the FBI were starting to come out, the political satirist Art Buchwald wrote a column about the the first known wiretap, which Buchwald hilariously portrayed as happening when J. Edgar Hoover, registered in a hotel under the name of "Zimbalist," tapped the phone of Alexander Graham Bell. Another Buchwald story about the FBI featured a source named "Efrem Zumgard." The point being, that's how identifiable with the FBI Efrem Zimbalist, Jr. had become. And yet The FBI was not Zimbalist's first hit: that would have come several years before, when he co-starred with Roger Smith in the Warner Brothers detective series 77 Sunset Strip. Even before that, he had a recurring role on another WB series, Maverick, as gentlemen con-artist Dandy Jim Buckley. It's probably no surprise that The FBI, a co-production between Warner and Quinn Martin, would choose Zimbalist as its lead. *Although he did have a pretty good singing voice. 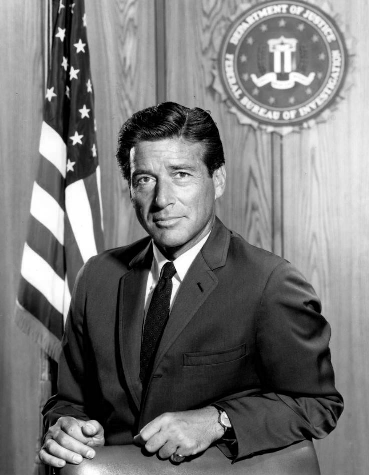 Throughout his years as Lewis Erskine, Efrem Zimbalist, Jr. presented himself with dignity and integrity. Unlike today's dramas, you seldom ever saw a glimpse of Erskine's personal life, or even the home he lived in. He was a widower, we knew that, and he had a daughter at the beginning of the series (played by Lynn Loring) who was engaged to Jim Rhodes (Stephen Brooks), Erskine's partner, but that subplot quickly disappeared, as did Lee Meriwether's appearance as Erskine's lady friend. The fact was, when you're fighting the Communists for the FBI, there wasn't time for anything else. And in the same way that Jack Webb* became synonymous with the LAPD, Zimbalist was the FBI, to the point that he received an honorary special agent badge from the Bureau in 2009. For nine seasons Zimbalist protected the nation, and for years afterward heard from those who'd joined the Bureau because of the show. He called it "the most tremendous reward that I could ever have for having done it." And though I never did join the FBI (probably to the nation's benefit), The FBI remained a favorite show of mine, and Zimbalist a favorite actor. When the series was finally released on DVD beginning a few years ago, it quickly found a place in the collection. *Who produced the final season of 77 Sunset Strip, in which all existing characters were axed from the show - except for Efrem Zimbalist, Jr.
A terrific three-part article at TV Party! by L. Wayne Hicks tells much more about the show, particularly Hoover's reaction to it. But from beginning to end, there was no doubt that Efrem Zimbalist, Jr. was the man who made it work. He died over the weekend, aged 95, leaving yet another hole in television's history. The greatest testament I can give to him is that the FBI would be far, far better off today had there been more real-life agents like Lew Erskine.